It looks like we can expect an announcement soon on whether Comic-Con will be moving from San Diego and if so, where. Last week, a pretty impressive Facebook page promoting Los Angeles as the new home of Comic-Con was launched. It features some nice color drawings from Doug Davis, who does the editorial cartoons for The Downtown News. It also lays out a very confident and compelling case for Los Angeles as a good home for the convention. They did a good job of dispelling myths about the area that are easy to believe if you haven’t been in the area in a while. I have spent a fair bit of time down at L.A. Live in the past six months, seeing movies at the new and excellent Regal Cinemas (all digital screens, great 3D), visiting the Grammy Museum, eating at the restaurants (The Yard House, Trader Vic’s, Fleming’s Steakhouse) and heading over to Staples Center to cheer on the Kings, who take on Vancouver in the first round of the NHL playoffs. Yes, this spot that once was a dirt parking lot next to the freeway has, especially with the opening of the new J.W. Marriott Hotel and the Ritz Carlton hotel and residences (I hear Hayao Miyazaki bought the penthouse for $10 million and made the builders customize the column placement to accommodate his feng shui requirements), is on its way to becoming a world-class entertainment district. San Diego meanwhile has responded with movement on a plan to expand the convention center and add the space Comic-Con has been requesting. But it seems to me that the Los Angeles bid is gaining momentum, with the professional Facebook page, my gut feeling that the San Diego move is too little too late and a comment from AEG Group President and CEO Tim Leiweke at a civic event late last week about pending announcements for major new conventions coming to town. Here’s what I know about the comments: Leiweke made them last week before about a thousand people at the Central City Association’s Treasures of Los Angeles event held at the J.W. Marriott at L.A. Live. I was not at the event myself, but folks who were there have confirmed what he said. Leiweke said he didn’t want to steal the Convention Center’s thunder, but he was quite excited that announcements would soon be made that two of the nation's largest conventions are coming to the Los Angeles Convention Center in the next three or four years. That’s not much, obviously. It’s just a hint, and it’s easy to imagine that it’s confident bluster, or possibly referring to other shows. But it also fits with the timeline Comic-Con has announced for making its decision on whether to stay in San Diego or to move. And my gut tells me this is going to happen. And I am the first to admit that my gut is not always right. But sometimes I'm not completely wrong, either. But the more I think about it, the more I like the idea. L.A. is definitely preferably to Anaheim, which, with all due respect, is, outside of Disneyland, pretty dull and lacking in the nighttime amenities for parties, fine dining and hanging out that make San Diego and now L.A. so much fun. You can’t really walk from the convention center in Anaheim to a bunch of cool hotels or fun restaurants (unless Denny’s qualifies as a fun restaurant, which to me it does not). Plus, there already is a pretty massive year-round attraction in Disneyland that fills up the city’s hotels and restaurants pretty well, especially during summer. Downtown Los Angeles, however, is definitely on the upswing. There still are some scary parts (Skid Row) not too far away, but most of the rest of the area from the Arts District to Little Tokyo to Broadway is blossoming with cool new restaurants, bars and restaurants. Transportation has improved tremendously with the Metro, which will further be improved in the coming years with the regional connector and a modern streetcar route (like the one in Portland) set to be up and running in 2014. There’s a lot of parking in downtown, and it could use more hotels within walking distance, but public transit is making it easier to quickly commute from as far away Hollywood, Pasadena, Long Beach or even the Mid-City/Koreatown areas (and locations in between) — all of which offer interesting attractions in their own right. The Los Angeles Convention Center itself will be a major change for the show, as its space is divided among three halls of various sizes, with a connecting passage over Pico. I don’t know where they would put the meetings, as it doesn’t appear to have as much meeting room space as San Diego, though the proximity of both the Nokia Theater and even Staples Center pose some interesting possibilities for replacing the makeshift Hall H with something both truly spectacular and large enough to handle the crowds. The facility itself may be the weakest part of this proposal, but it has played host to numerous E3 Expos as well as the 2007 Star Wars Celebration IV and been more than adequate. But most of all, there is a feeling of confidence and competence in the Los Angeles effort lacking in the other campaigns. It feels like L.A. wants the show and is enthusiastic about it and has enough to offer the show to make it worth gambling on a move to L.A. San Diego, I think, has long taken the show for granted and it’s too late at this point for the city to come in and undo years of bad-mouthing the show and failing to address its concerns. On a more personal note, this will be the first San Diego con I will have to miss since 1996. The reason is a family event that requires travel back east. And while I will definitely miss the convention, there is a part of me that's maybe just a bit relieved that I won't have to deal with the stress of conspiring to find a way into Hall H to see a movie panel or fight through the crowds to spend a few minutes chatting with very cool people I usually only get to see at Comic-Con. I plan to be back in 2011 and 2012, and then wherever the show leads in 2013. 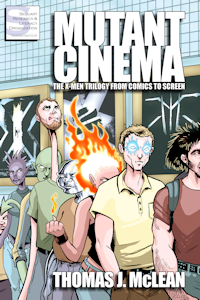 Mutant Cinema: The X-Men Trilogy from Comics to Screen. Published by Sequart. Copyright © 2014 by Thomas J. McLean. All rights reserved. Simple theme. Powered by Blogger.